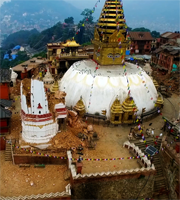 Nepal is a densely populated area and the most recent major earthquake took place in 2015. A tectonics team from the Earth Observatory of Singapore has been studying the fault that passes through the Ratu River at the feet of the Himalaya, 140 kilometers south of Mount Everest, in the South East of Nepal. The goal of this EOS scientific research is to find out what sections of the fault are yet to break, and when this might happen again. magnitude 7.8 Gorkha earthquake. Image courtesy of Kishor Rana. The Ratu River Expedition is a 25-minute film featuring the research on Nepal earthquakes by the EOS Structural Geology group. The film was written and directed by Isaac Kerlow, and it shows how the scientific team uses a variety of techniques and technologies to collect data on the field for later analysis. This includes a massive truck called the EnviroVibe which vibrates the ground between 10 to 300 pulses per second, sending sound waves up to 2 kilometers deep. The sound waves reflect off the rock layers and are used to visualize the faults and underground structure. The Envirovibe truck allows scientists to visualize the faults that might be located underground. The truck operates in combination with a set of geophones to detect ground vibrations after they pass through the subsurface, and bounce back to the top. Data is collected by the DaqLink and sent to the main computer for processing via Wi-Fi. On a productive day, the truck can survey more than one kilometer. are useful to better judge the seismic potential of the fault. The previous large earthquake in Nepal took place in 1934 and it destroyed sections of the Royal Palace. One of the survivors of multiple Nepal earthquakes, Mr. Jeevanath Koirala, vividly remembers the 1934 earthquake: I was getting down after cutting the grass when the earthquake happened. I went home but half of it had already collapsed. There were landslides in some areas and houses were destroyed. Even the ground split open and fish came out. Those who went to the forests perished in landslides. Some people in the villages could not even take out children from their cribs. 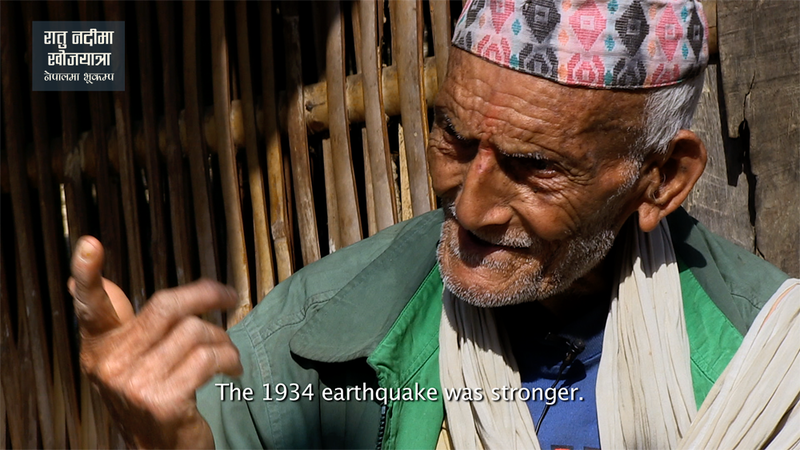 1988 and 1934 earthquakes in Nepal, both of which he experienced.